This is a wonderful, original letter dated 1759, Albany, New York, where William Gamble has written to Barrent Roseboom, assistant agent to the victualers, regarding the proper way vouchers were to be handled.....signed Wm. Gamble. 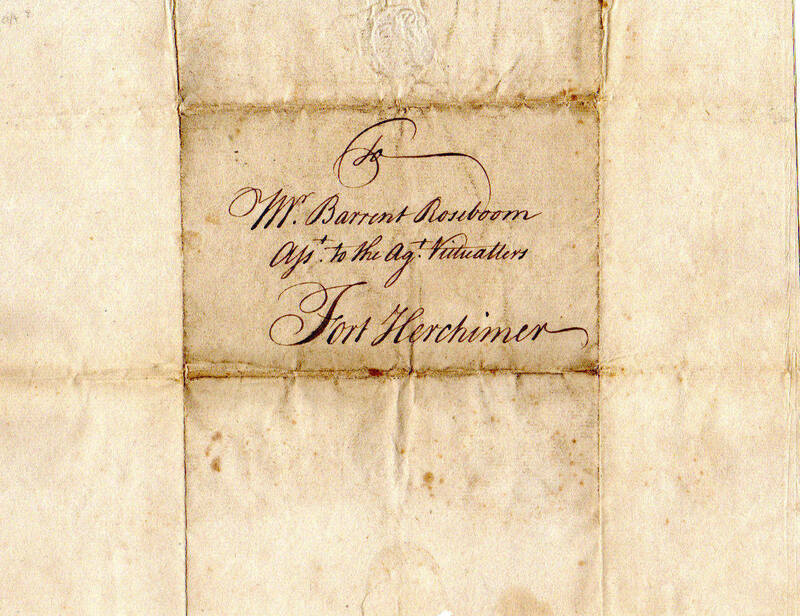 Verso is addressed to Rosenboom at Fort Herkimer. Letter is 8x10, folds, minor aging, else a scarce item regarding Fort Herkimer. Gamble, William, British Army Commissary, Freemason, Merchant of Albany. William GAMBLE, upon his arrival in Boston, went to work on the ferry from Charleston to Boston. Here he remained two years. During the Indian War of 1745, he joined several "scouts," and upon the commencement of the "Old French War," in 1755, having lost his wife, he enlisted in the regular service, and was in most of the war, being under WOLFE on the "Plains of Abraham." The Scottish Rite of Freemasonry was first brought to the New World from France in the year 1763. Bro.Stephen Morin of Bordeaux established the 25 Masonic Degrees of the "Rite of Perfection" in the British West Indies. In 1767 Stephen Morin's close associate Henry Francken transported this new Masonic Rite to Albany, New York, where he formed the first Ineffable Grand Lodge of Perfection in North America, with civil engineer Bro. William Gamble serving as its first master. Bro. William Gamble, the first Master of Ineffable Lodge of Perfection, was a Civil Engineer by profession and a draftsman of ability. It was he who, probably, executed the "Constitution and Patent" of Ineffable Lodge and he also prepared tracing boards for many of the Degrees. Fort Herkimer was a fort located on the southern side of the Mohawk River, opposite West Canada Creek, in central New York, United States. The fort was first built in 1740, around the homestead of the Herscheimer (Herkimer) family. In 1757 during the Seven Years War, young Captain Nicholas Herkimer (later to be a heroic general in the Revolutionary War) had his first military command here when the French attacked German Flatts in 1757 and 1758. It has originally known as Fort Kaouri (Fort Bear). 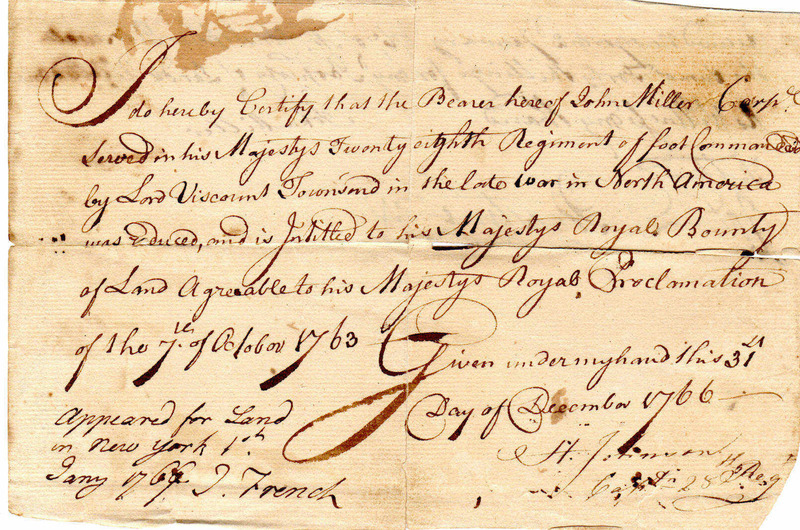 This is a wonderful, original document dated 1766, where John Miller, Corporal of His Majesties 28th Regiment of Foot has been granted a plot of land according to the Proclamation of 1763, Given at New York, signed by Captain Henry Johnson on front and by John Millert and John DePeyster on back. Document is 6x8, folds, age toned,splits along folds, in overall good shape. Rare document signed by famed General,Sir Henry Johnson. Sir Henry Johnson, 1st Baronet (1 January 1748 – 18 March 1835) was an Irish soldier. He was the second son of Allen Johnson of Kilternan, County Dublin, and his wife Olivia, daughter of John Walsh of Ballykilcavan, Queen's County. He was appointed ensign on 19 February 1761 in the 28th foot, in which he became lieutenant in 1762, and captain in 1763, and is stated to have served with the regiment (probably in the West Indies) during that time. He became major in the 28th in 1775, went to America, and was posted by Sir William Howe to one of the provisional battalions of light infantry, which he commanded in the campaigns of 1776–8. He was appointed lieutenant-colonel 17th foot on 8 October 1778, and commanded that regiment in the operations in the Jerseys, and afterwards in Virginia and Carolina, under Lord Cornwallis. On the surrender at York Town in October 1781, he returned home and remained unemployed until the peace. He subsequently commanded the 17th foot in Nova Scotia and Newfoundland. At the commencement of the war with France he was appointed inspector-general of recruiting for the English establishment in Ireland, and held the post until 1798. During the rebellion in that year he was detached with three thousand men to occupy New Ross, and defeated the rebels when they attacked the place on 5 June 1798. It was the hardest fight during the rebellion. Lord Cornwallis had an indifferent opinion of Johnson, and wrote of him as "a wrong-headed blockhead". Johnson was made colonel 81st foot in 1798, became a lieutenant-general in 1799, and governor of Ross Castle in 1801. He held a major-general's command in Ireland from 1798 to 1803, became a full general in 1809, was created a baronet on 1 December 1818, and in 1819 was transferred to the colonelcy of the 5th foot. He died on 18 March 1835, at the age of eighty-seven, at Bath, where there is a masonic monument to him in the Abbey Church. Captain John Ritchie was the Master of the ship Providence‚ a British ship under contract with the Navy Board to transport troops to America. The Providence was owned by English merchant Nathaniel Bayles, by the 1780s the Providence had been hired by the navy and become a Transport taking troops over to fight in the war in North America. The Providence transported Hessian and Scottish regiments as well as supplies needed in New York. New York was under embargo by the surrounding colonies and the only way to get fresh supplies was from the local sympathizers or from England and her colonies. As a side note, the National Archives has a grouping of letters from the Ship Providence showing that the Providence was also a slave ship.Title of the archive in the National Archives is as follows....."John Ritchie, captain of ship Providence: corresp to Nathaniel Bayles of Newcastle while sailing between New York and Jamaica, voyage accounts, crew wages lists, slave cargoes and the Providence's involvement in the American War of Independence 1780-1782 ". 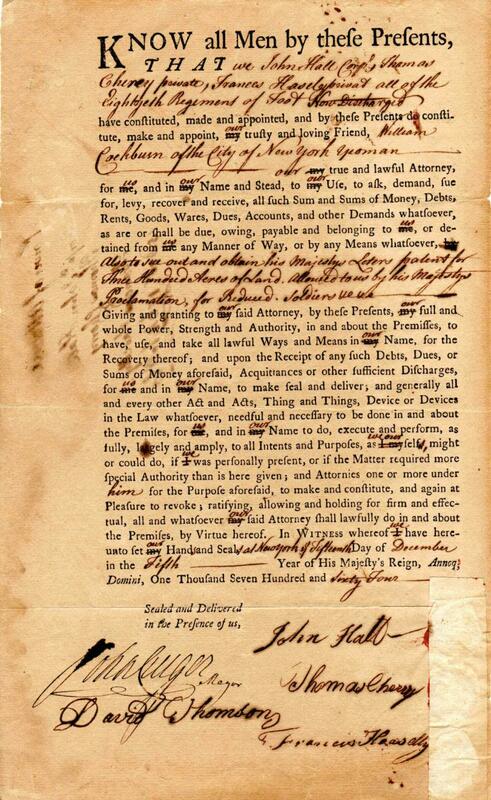 This is a wonderful, original document, dated 1756, Brimfield, Massachusetts, where Josiah Dwight has signed a document regarding Trevance Webber purchasing a firelock from the widow Nelson and that Webber paid her the full amount for it....signed Josiah Dwight. Document is 4x6, folds, minor split along top fold lines. Colonel Josiah, son of Captain Henry and Lydia (Hawley) Dwight, was born October 23, 1715, died September 28, 1768. He had the best educational advantages, graduating from Yale in 1736, and was counted a rich man in his time. He owned five thousand acres of land, and was an enterprising, energetic, prosperous man. of high respectability and influence. His property was inventoried at his death as follows: He was a merchant, was a manufacturer of potash, and had an iron foundry. 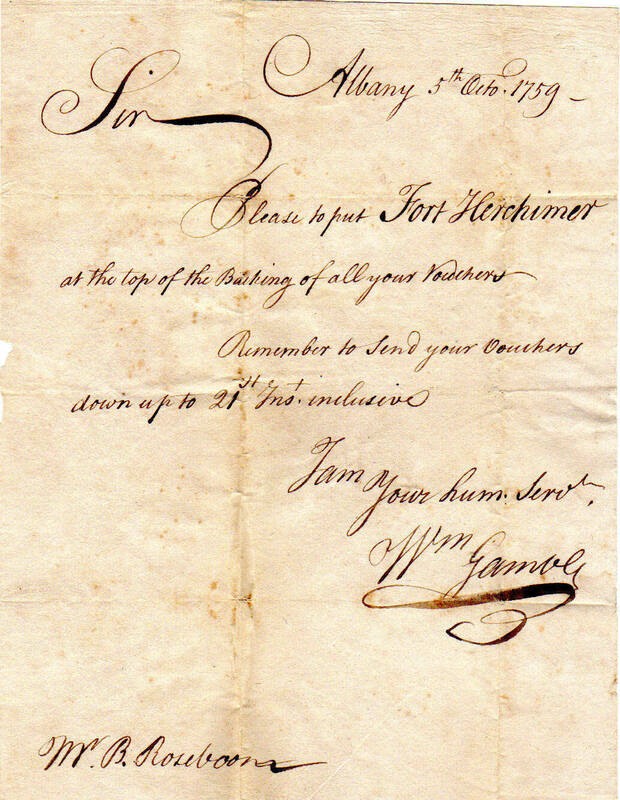 This is a wonderful, original document, dated 1757, Fort Edwards, where Samuel Thornton has signed as having received his payment for service under Captain Benadam Gallup in the last campaign....signed Samuel Thornton. Document is 3x6, overall fine shape. Benadam Gallup (1716-1800) Colonial and Revolutionary era military figure was a distinguished soldier who served as a Captain of Rangers in the French and Indian Wars at Fort Edward and many other colonial expeditions. He acquired the title of Colonel during the French and Indian Wars. The Connecticut Assembly raised 1400 men and established them as the 12th Co. made up of men mostly from Groton and Preston under the command of Col. Benadam Gallup. In June 1776, as Colonel, he and his company of men went to reinforce Washington in New York, and was present at the front during the Battle for Long Island, during the retreat to New York City, during the retreat from New York City, and with the Army at White Plains. Buried in Ledyard, Connecticut, which at time of his death was Groton, Connecticut.